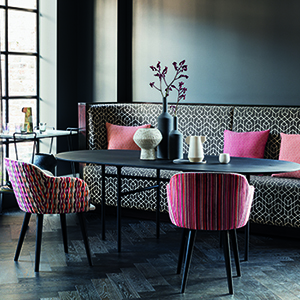 The Romo Group has six established brands, Romo, Black Edition, Kirkby Design, Mark Alexander, Villa Nova and Zinc Textile, all of which have their own unique identity. Uncompromising on style and durability, The Romo Group have created a range of contract specific collections featuring elegant and eye-catching designs in a palette of on-trend shades. Designed using Trevira CS and fire-retardant yarns, each quality meets the stringent demands of the contract interiors market.